Ribbons (previously called Ondes) is one of our favorite iOS apps and it just got a substantial update. Olympia Noise Co. has got in touch with to us to announce the release of the version 1.4 of Ribbons, their Ondes Martenot-inspired polyphonic wavetable synthesizer. 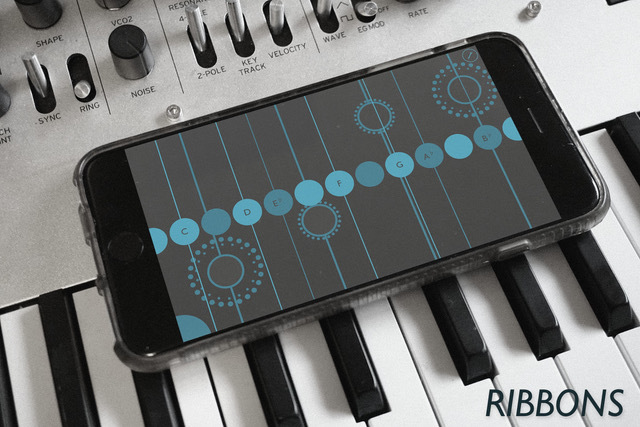 With this free update, Ribbons is now universal, supporting iPhone 5s and newer, and adding support for MIDI Polyphonic Expression (MPE) output. On the iPhone, Ribbons now can map touch pressure (Z-Axis) to control various parameters of the synth, including LFO Depth and Rate, Wavetable, Volume, and Filter setting. Z-Axis can also be used to send MPE control messages. Z-Axis is only available on devices that support 3D Touch (iPhone 6 and newer). When Ribbons (née Ondes) launched in 2014, MPE was not yet a MIDI standard, so the implementation of the MIDI output was a bit of hack; Each finger could be mapped to a unique MIDI Port and Channel, allowing each touch to control a different MIDI destination. While this mode is still available (“Classic mode”), Ribbons now supports the MPE MIDI standard, allowing you to use the unique Ribbons interface to control MPE synths like Moog Model D and Model 15. For a full list of features, visit Ribbons on the App Store.